In the wake of Monday’s hostage standoff in a central Sydney cafe, the entire Australian media and political establishment has backed the federal government’s announcement of a “review” in order to justify a raft of draconian new measures. From the very outset, the incident has been seized on to advance the reactionary agenda behind the “war on terror”—support for US military operations abroad and deeper attacks on fundamental democratic rights at home. Abbott’s remarks sought to divert public attention from the government’s own role in manufacturing a national “terrorism” crisis—under conditions of shock and horror produced by the police shootout in the early hours of Tuesday. Having been deliberately kept in the dark throughout Monday by the government and the media, the population awoke to find that Monis and two innocent hostages—Katrina Dawson, 38, a barrister and mother of three, and the cafe manager Tori Johnson, 34—were dead. As of today, neither the Abbott government nor the New South Wales (NSW) state authorities has provided any official explanation for, or account of, the police storming of the Lindt cafe. None of the many questions surrounding the decision to activate the entire counter-terrorism apparatus on Monday have been answered. Instead, following his “query” on Tuesday, Abbott announced a joint review with the NSW government on Wednesday. The political purpose of the “review” is evident from its narrow terms of reference, directed at Monis, a mentally unstable Iranian refugee who was on bail on allegations of sexual assault and being an accessory to murder. By implication, Monis should not have been allowed into Australia, granted refugee status, unemployment benefits, legal aid or bail, and, if not in jail, should have been under constant police surveillance. Abbott’s claim that Monis was not closely watched by the police and the Australian Security Intelligence Organisation (ASIO) is absurd. Monis came to national attention when he was charged in 2007 with sending “offensive” letters to the families of Australian soldiers killed in Afghanistan. He staged many individual protests about his treatment at the hands of the police and ASIO. Following Australia’s largest-ever anti-terror police raids, on homes in Sydney and Brisbane, in September, ASIO Director General David Irvine declared that he was particularly concerned about “the so-called ‘lone wolf’ or ‘stand-alone’ groups who act independently and throw off few clues as to malicious intent.” Amid a growing drum-beat in the media about the danger of a “lone wolf” attack, the Sydney siege was made to order, to justify further repressive measures to overturn basic democratic rights and beef up the security apparatus. After all, if every individual who “throws off few clues” is now to come within the scope of ASIO, this is the recipe for a police state. That is already well underway, with the massive expansion of ASIO and its powers over the past decade. 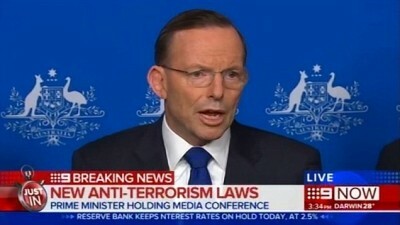 This year the Abbott government has pushed through three new tranches of anti-terror laws, with the support of the opposition parties, and will undoubtedly use the Sydney siege to ram through the fourth, involving the compulsory retention of the Internet “meta-data” for the entire population. This extraordinary statement is testimony to the lack of any constituency in ruling circles for the defence of essential democratic rights. Throughout the past week, there has been complete unanimity among parliamentary parties. During the siege, every media outlet functioned as an arm of the state apparatus, taking orders from the police and security officials about what could be published, probing nothing and criticising nothing. In its aftermath, they have continued to ask none of the essential questions. Above all, the Abbott government’s review seeks to deflect attention from the central question that must be posed: why was a terrible, but relatively straightforward, police matter elevated to the status of a national emergency involving the entire security apparatus? The political purpose of that decision, like the review, is to inflate the “war on terror” in preparation for greater Australian commitment to US-led conflicts and a deepening assault on the social and democratic rights of the working class.